Shigella is the etiological agent of shigellosis, a disease responsible for more than 500,000 deaths of children per year, in developing countries. These pathogens colonize the intestinal colon, invade, spreading to the other enterocytes. Breastfeeding plays a very important role in protecting infants from intestinal infections. Amongst milk compounds, glycosylated proteins prevent the adhesion of many enteropathogens in vitro. The aim of this work was to determine the effect of human milk proteins on the colonization potential of Shigella dysenteriae, S. flexneri and S. sonnei. To fulfill this purpose, pooled milk samples from five donors, were fractionated by gel filtration and affinity chromatography. Using tissue culture, the milk fractions obtained were tested in Shigella adhesion and invasion assays. Our revealed showed that both adhesion and invasion of Shigella species were inhibited by low concentration of secretory immunoglobulin A, lactoferrin and free secretory component. This work also showed that, these proteins bind to superficial and whole-cell Shigella proteins. Our findings suggest that human milk may act inhibiting adhesion and, consequently, invasion of Shigella, thereafter preventing shigellosis in infants. Shigella species are common etiological agents of shigellosis. This illness is responsible for 500,000 deaths of children per year, in developing countries . Clinical symptoms of shigellosis mainly due to acute inflammatory responses, are characterized by the presence of blood and mucus in the stools and intense damage of colonic epithelium. Of the four species of Shigella, three are frequently isolated from dysentery cases: S. dysenteriae, S. flexneri and S. sonnei . For many enteropathogens, adhesion to the host cells, mediated by either fimbrial or afimbrial adhesins, has been shown to be the primordial step of intestinal colonization . However, in Shigella, adhesion structures have not been well characterized and the importance of the adhesion process for colonization and pathogenesis remains unclear . Conversely, the ability to invade epithelial cells has been largely studied in S. flexneri. A 230 kDa plasmid that encodes many invasion proteins (invasion plasmid antigens – Ipas) and proteins of the type III secretion system (Mxi-Spa), was shown to be essential for the invasion process, allowing the entrance in human colonic cells, intracellular multiplication and spreading to adjacent cells . Many epidemiological studies have shown that breastfeeding protects infants against intestinal infections [6–9]. Immunoglobulins, mainly the secretory immunoglobulin A (sIgA) [10, 11], glycocompounds [10, 12] and oligosaccharides  have been implicated in the protection conferred by human milk against different enteropathogens. The most abundant immunoglobulin of human milk is sIgA (420 kDa), a dimeric IgA molecule covalently linked by a J chain and bounded to a molecule of secretory component (SC) [13–16]. De Araújo et al., 2000, demonstrated that sIgA has a protective effect against diffusely adherent E. coli (DAEC), enteroaggregative E. coli (EAEC)  and enteropathogenic E. coli (EPEC) . Furthermore, Carbonare et al., 1995, reported that sIgA inhibits the invasion of enteroinvasive Escherichia coli (EIEC) to HeLa cells , an E. coli pathotype that displays a virulence mechanism very similar to Shigella species. Additionally, non-immunoglobulinic glycocompounds such as lactoferrin (Lf), an iron-binding glycoprotein and free secretory component (fSC) have been associated with milk protection [3, 18, 20]. It was described that Lf binds to different radiolabeled proteins from both E. coli and S. flexneri [21, 22]. Likewise, Lf inhibits EPEC adhesion to HeLa cells  and binds to fimbrial structures of enterotoxigenic E. coli (ETEC) . Recently, Gomez et al., 2002 and 2003, respectively, showed that a high concentration of recombinant lactoferrin (>1 mg.mL-1), produced in Saccharomyces cerevisae, protect rabbits against inflammatory enteritis caused by Shigella flexneri , and impairs S. flexneri M90T invasion, but not adhesion to HeLa cells, by inducing IpaB degradation . Similarly, recent studies showed that fSC inhibits most the enteroadherent E. coli, and binds to fimbrial adhesins of ETEC [18, 23]. Apart from the Lf data described above, the knowledge regarding the effects of human milk components on the adhesion and invasion mechanisms of Shigella towards host cells is quite reduced. Therefore, the aim of this work was to investigate the effect of the human milk proteins on the ability of Shigella to adhere and to invade HeLa cells. We have also investigated the target bacterial components recognized by milk proteins. The highest protein concentration of whey and casein used on the assays was 600 μg.mL-1 since the cytotoxic effects on Hela cells were observed with higher concentrations. While casein did not affect the invasion of the three Shigella species tested, whey decreased the number of invading bacteria in more than 50% (Table 1). E. coli HB101 and S. flexneri BS176 did not invade HeLa cells (data not shown). Effect on invasion of S. dysenteriae. S. flexneri and S. sonnei of whey, casein, PIS (sIgA), P2S (Lf, SC and albumin, SA), P3S (α-lactoalbumin), P2H (fSC and SA) and P3H (Lf). Fractions corresponding to each peak obtained from the gel filtration chromatography, at approximately 300 μg.mL-1, were used to determine the capacity of inhibiting Shigella invasion (Table 1). While P1S (sIgA) and P2S (Lf, fSC and albumin) exhibited more than 40% inhibition of Shigella invasion, P3S (α-lactoalbumin) presented no effect on Shigella invasion. Since P2S is composed of three different proteins (Lf, fSC and albumin), this fraction was further investigated by testing each component individually. No inhibition of invasion was observed when pure commercial albumin was used (data not shown). Lf or SC or both might be responsible for the inhibition when P2S fraction was assayed. Thus, to isolate Lf from the fSC, concentrated whey was submitted to affinity chromatography on fast-flow heparin sepharose. Three protein peaks were obtained, and denominated P1H, P2H and P3H. Electrophoretic analysis of proteins eluted in each peak revealed that P1H presented protein bands correspondent to sIgA and α-lactoalbumin. P2H presented bands corresponding to fSC (78 kDa) and albumin (56 kDa). Purified lactoferrin was eluted in the P3H (78 kDa) (Fig 1). Western blotting analyses of proteins isolated in P2H and P3H using antiserum to Lf or SC confirmed the presence of fSC in the P2H and Lf in P3H (Fig. 1). fSC and Lf (~330 μg.mL-1) strongly inhibited the invasion of the three Shigella species studied to the HeLa cells (Table 1). Identification of Lf and fSC separated by affinity chromatography (Heparin Sepharose). Commassie-blue-stained SDS-PAGE 12.5%, lanes 1; 3; 5 show the protein content of respectively P1H (sIgA and α-lactoalbumin), P2H (fSC and albumin) and P3H (Lf). Lanes 2; 4 and 6 represent western blotting analysis of P1H, P2H and P3H revealing respectively bound SC of sIgA, fSC and isolated lactoferrin. Lf has been associated to a decrease of bacterial growth . Therefore, the effect of this compound besides fSC on the growth of three Shigella species was determined, under the same conditions used in our standard inhibition assays. No differences on colony forming units (CFU) in the presence or absence of Lf or fSC were found, suggesting that, under the assay conditions, purified Lf and fSC was not able to influence bacterial growth. The reduced number of bacteria observed inside HeLa cells when the invasion assay was performed could be due to either the direct effect of milk proteins on one or more stages of the invasion process, or to the action of these compounds impairing bacterial adhesion to the cultured cells. Whey (2.8 mg.mL-1), sIgA (0.33 mg.mL-1), Lf (0.3 mg.mL-1) and fSC (0.33 mg.mL-1) on Shigella adhesion was also assayed using the non invasive, but adherent, S. flexneri BS176 strain and the wild type S. dysenteriae and S. sonnei strains. The treatment of the Shigella strains with these compounds leads to a strong inhibition of adhesion (Table 2). Effect on the adhesion of wild type S. dysenteriae, S. flexneri BS176 and wild type S. sonnei of. whey. PIS (sIgA). P2H (fSC) and P3H (Lf). The effect of anti-fSC (that also binds to SC complexed with sIgA) and anti-Lf on the inhibition mediated by fSC, sIgA and Lf, respectively, were also investigated. The exposition of Lf, fSC and sIgA to their respective antibodies suppressed the inhibitory effect of these proteins, in both adhesion and invasion of the three Shigella species. Figure 2 shows the results obtained using S. flexneri. Similar results were obtained when S. dysenteriae and S. sonnei were analyzed. Effect of specifics antibodies and sodium metaperiodate (SM) on the inhibitory activity of sIgA, fSC and Lf on the wild type S, flexneri invasion (A) and S. flexneri BS176 adhesion (B). Invasion and adhesion of S. flexneri on HeLa incubated, white bars, or not incubated, black bars, to milk proteins. The inhibitory activity of the sIgA, fSC and Lf was lost when incubated with anti-SC or anti-Lf (dots bars) or metaperiodate (vertical lines bars). Data presented are means ± standard deviations of three separate experiments in triplicate. Lf and fSC are highly glycosylated proteins. Therefore, the outcome of the exposition of these glycoproteins exposition to sodium metaperiodate was determined. 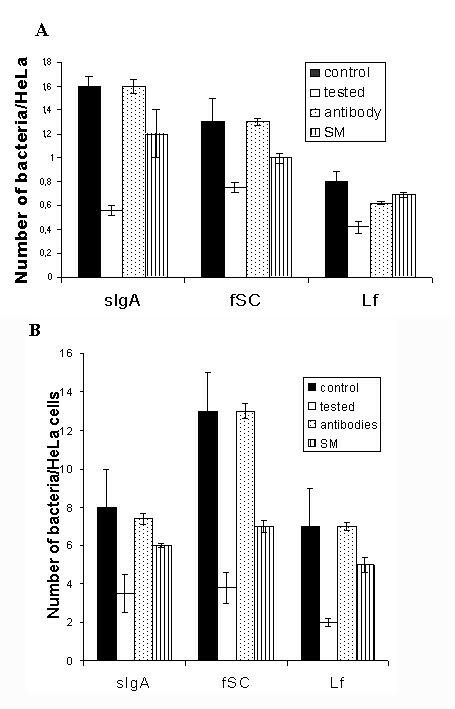 Figure 2 shows that the treatment reduced the inhibition ability of Lf and fSC in both, adhesion and invasion of the three Shigella species to HeLa cells. Secreted and surface proteins (SSP) and intracellular proteins (IP) extracts were used to perform a modified western blotting to investigate the Lf and sIgA binding abilities to bacterial components. E. coli HB 101 extracts were used as negative control. sIgA was able to bind to four (26; 38; 45 and 68 kDa) and seven (23; 35; 38; 49; 56; 57 and 58 kDa) proteins, respectively, from SSP and IP extracts (Fig. 3, lanes 2 and 5). Three proteins (23; 26; and 38 kDa) from SSP extract and two (23 and 38 kDa) from IP extract were recognized by Lf (Fig. 3, lanes 3 and 6). No protein extract from E. coli HB101 was able to bind to sIgA or Lf (data not shown). Bacterial proteins recognized by sIgA and Lf. (A) Surface and supernatant proteins. Lane 1, stained with coomassie blue. Lane 2 (lanes 2 and 5) and Lf (lanes 3 and 6) bound to supernatant and surface proteins (A) and intracellular proteins (B). 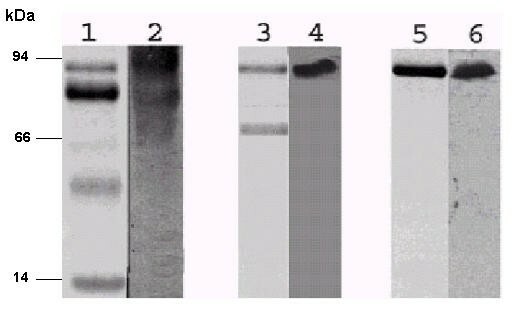 Modified Western Blot, after the transference the membrane containing SSP and IP was incubated with P1S-sIgA or P3H-Lf overnight, following incubation with anti-SC or anti-Lf to respective sIgA or Lf. Marked supernatant with surface proteins have 26, 38, 45, 68 kDa and intracellular proteins with 23; 35; 38; 49; 56; 57; 58 kDa bound to sIgA (lanes 2 and 5). Surface proteins with 23; 26; 38 kDa and intracellular proteins with 23; 38 kDa bound to lactoferrin (lanes 3 and 6). In this study, we show that human milk immunoglobulin fraction (sIgA), fSC and Lf inhibit adhesion and invasion to HeLa cells by three Shigella species. The inhibitory activity seems to be similar among the three Shigella species studied. Thus, the human milk inhibitory activity could have the same target mechanism, impairing the virulence of the three species studied. Several reports have pointed out an important role for immunoglobulins, mainly sIgA, on human milk protective effect against diarrhea [14, 17, 18]. sIgA inhibits the adherence of many pathotypes of E. coli, including EIEC which shows similar virulence aspects when compared to Shigella [18, 19]. Similarly, two glycoproteins, Lf and fSC, were shown to be involved in the inhibition of ETEC, EAEC and EPEC adherence [23, 24]. In the present work, we have shown that these two glycoproteins, in concentrations lower than those found in human milk, inhibited the adhesion and, consequently, the invasion of the three Shigella species. Furthermore, our findings indicate that sIgA and Lf bind to Shigella superficial proteins with molecular mass similar to the virulence proteins involved in the invasion mechanism , suggesting that these components could inhibit the two virulence processes independently. Little is know about the role the fSC found in secretions, although some studies suggest that it may play a protective role against diarrhea [18, 20]. In our work show that fSC from human milk inhibited the adhesion and invasion of Shigella in vitro, indicating that this compound may be an important non-specific defense factor. Interestingly, fSC is also found in intestinal secretions where it may provide protection to mucous membranes, the initial target in most infections. Our findings further corroborated this hypothesis since anti-SC diminishes the inhibition activity of sIgA and fSC on Shigella invasion and adhesion. Furthermore, it is interesting to note that anti-SC inhibits the effect of both sIgA and fSC, therefore the bounded SC of sIgA may be involved on the inhibitory activity. On the other hand, sIgA complexed with the anti-SC may lead to esteric impairment. Lf is considered as an important non-specific defense factor against gastrointestinal infections, causing microorganisms iron-deprivation by its iron-scavenging ability [3, 26]. In the present work, we show that Lf isolated from the human milk also affected adhesion and invasion of S. flexneri BS176 (S. flexneri M90T cured of the virulence plasmid), S. flexneri, S. dysenteriae and S. sonnei wild type strains. Previous studies  have established the association of fucosylated oligosaccharides in human milk with adhesion inhibition of enteropathogens to Hep-2 cells. Lf, sIgA and fSC, rich in fucosylated residues, when treated with sodium metaperiodate, lose the ability to inhibit both, Shigella adhesion and invasion. This result confirms the importance of the sugar residues in natural glycoproteins. Gomez et al. showed that recombinant Lf have no effect on the adhesion of the S. flexneri M90T strain to HeLa cells , probably, due to the recombinant lactoferrin not to possess the same structure of sugar residues, loosing the capacity of inhibiting the Shigella adhesion. Studies have suggested a role of human milk glycocompounds as cell surface homologues, inhibiting pathogen binding to host cell receptors . Newburg et al., 1992, described that glycolipid Gb3 from human milk, a natural shiga toxin receptor, could null the effect of this toxin on the host cells . Human proteins, such as Lf and fSC could play the same role, probably acting as receptor analogues of adhesins or invasines. On the other hand, the work of Gomez et al. indicates that recombinant lactoferrin promotes a degradation of virulence factors, such as Ipa B, impairing the formation of the IpaBC complex on the surface of the host cell. Moreover, our findings suggest that sIgA and Lf bind to proteins with similar mass of Shigella virulent proteins: IpaJ and MxiJ (26 kDa), VirB (35 kDa), IpaD (37 kDa), VirA (45 kDa) or IpaA (68 kDa). These results suggest that Lf and sIgA prevent the interaction between the bacteria and host cells, impairing the invasion complex formation. Studies have demonstrated that exclusive breastfeeding during the first six months of life protects infants against many bacterial infections. However, the protection mechanism against diarrhea remains partially unclear. Our findings suggest that other human milk components, different from immunoglobulins, such as fSC and Lf glycoproteins could play an important role protecting against the adhesion and invasion of Shigella, therefore, preventing shigellosis in infants. Strains of S. dysenteriae, S. flexneri and S. sonnei, isolated from children with diarrhea in Brasília-DF, were provided by the Health Secretary of Distrito Federal, Brasília-DF-Brazil. S. flexneri BS176, a 230 kb virulence plasmid cured strain, was kindly provided by Dr. Philippe Sansonetti – Institut Pasteur, Paris, France and was used as adherent and non-invasive control. E. coli HB101 was used as a non invasive and non adherent control. Bacteria were grown in Trypticase Soy Broth, (TSB) (Difco, USA) at 37°C, overnight in a shaker. All strains were stored at -70°C in TSB medium containing 15% glycerol. Human milk samples from Brasilia University milk bank (Brasilia-Brazil), were pooled from five donors in the first lactation month, to avoid individual variations. Whey was obtained, as previously described by Mestecky et al. . Briefly, the pooled milk samples were centrifuged for 1 h at 5000 × g, in order to separate fat and cells. Defatted milk was acidified to pH 4.6, with citric acid, incubated overnight, and centrifuged for 20 min at 3000 × g in orderto isolate casein. Whey proteins were then concentrated by precipitating with 70%; ammonium sulfate redissolved in Tris HCl pH 7.6 and dialyzed against the same buffer. Immunoglobulin and non-immunoglobulin fractions of the concentrated whey proteins were separated by gel filtration chromatography in a Sephacryl S-200 HR column (2,6 cm × 80 cm; Amershan Pharmacia Biotech; Sweden) equilibrated with 0.1 M Tris HCl, pH 7.6; supplemented with 0.2 M NaCl, containing 1 mM phenylmethanesulfonyl fluoride (PMSF), 0.1% NaN3 and 50 mM of the ε-amino η-caproic acid (ACA). Proteins were eluted from the column using a Pharmacia Gradi-frac chromatography system at a flow rate of 3 mL.min-1, and 1.2 mL fractions were collected. Three protein peaks (P1S, P2S and P3S) were obtained and analyzed on the SDS-PAGE as described by De Araújo et al. showing a typical milk protein profile. For the isolation of Lf and fSC, concentrated whey was applied on affinity Heparin Sepharose fast flow column (0.5 cm × 15 cm, Amershan Biosciences-USA), equilibrated with 0.1 M Tris HCl, pH 8.0 and supplemented as described above. Protein fractions of 1.2 mL were obtained using a flow rate of 0,8 mL.min-1. Proteins were eluted using 0.2–1.0 M NaCl gradient. After many chromatographic runs, the fractions obtained were pooled and the proteins were precipitated with ammonium sulfate to 70% final saturation, centrifuged, and dialyzed. The concentrate proteins were resolved on a 12.5% SDS-PAGE performed at a constant voltage of 5 V.cm-1, in a Mini-Protean II cell unit (Bio-Rad, USA). Protein concentrations were determined according to the Bradford method . Milk proteins effect on invasion of Shigella was assayed as described by Clerc and co-workers with adaptations . Bacterial cells from mid-log-phase culture were initially incubated for 30 min with 0,1 M Tris HCl, pH 7.6 (positive control), casein, whey or whey fractions, resuspended in 199 medium (Gibco-BRL, Life Technologies, USA), until the culture reached 0.8 OD (105 CFU.mL-1) at A600, inoculated in semi-confluent HeLa cells in a 24-well microtiter plate. The plate was centrifuged for 10 min at 2,200 × g, in order to promote bacterial contact to HeLa cells, and then incubated for 45 min, at 37°C, in 5% CO2 atmosphere. HeLa cells were washed four times with phosphate buffered saline (PBS), overlaid with 199 medium containing gentamicin (50 μg.mL-1; Gibco-BRL, Life Technologies, USA), in order to eliminate extracellular bacteria, and further incubated for 90 min. HeLa cells were washed four times with PBS, detached (EDTA 0.5% and trypsin solution 0.1%), quantified on a Newbauer chamber, lysed with sodium desoxycholate 0.5%, at room temperature, with the remaining bacterial suspension plated on TSA (Difco, USA). CFU were determined after overnight incubation at 37°C. Similar procedure was performed to measure the effect of milk proteins on bacterial adhesion, described by Kusters et al. . Clinical isolates of Shigella and S. flexneri BS176 were grown in a shaking incubator at 37°C for 18 h. The culture was centrifuged for 10 min at 3,000 × g. In order to prevent invasion of wild types bacteria, the pellet was resuspended on TSB medium contained cloranphenicol (10 μgmL-1, Sigma, USA) and incubated at 37°C for 30 min. Subsequently, bacteria were incubated with the milk proteins for 30 min and added to semi confluent HeLa cell culture. HeLa cells and CFU were determinate as described above. All experiments were carried out in triplicate in three independent experiments. Protein fractions were resolved in 8% SDS-PAGE, transferred into nitrocellulose membranes (hybond C, Amershan Biosciences, USA) and immunoblotted. The membranes were saturated with 0.1% tween 20 (v/v); 1% bovine seric albumin (w/v), for 12 h at 10°C and incubated with either polyclonal anti-human fSC (Sigma, USA) or polyclonal anti-human Lf (Sigma, USA) antisera diluted to 1:2,000. Anti-goat or anti-rabbit peroxidase conjugated IgG antibodies were diluted to 1:10,000 and used as secondary antibodies. Proteins bound to these antibodies were detected by ECL western blotting analysis system (Amershan Biosciences-USA). The effect of polyclonal anti-lactoferrin (1:1000; Sigma) and anti-SC (1:2000; Sigma) was determined by adding the respective antibody to milk fractions for 1 h, prior incubation with bacteria cells. The adhesion and invasion inhibition assays were carried out as described above. Either Lf or fSC (~300 μg.mL-1) were treated with sodium metaperiodate (0.02 M) at 4°C, for 6 h. Modified glycoproteins were utilized in the standard adhesion and invasion inhibition assays. Enriched fraction containing either SSP or IP were extracted from Shigella strains cultured on Congo Red TSB (Difco, USA). Surface and secreted proteins were prepared by harvesting bacteria at mid-to-late logarithmic phase grow, which were heated at 60°C for 40 min, and centrifuged at 4,000 × g for 20 min. Supernatants were concentrated with 70% ammonium sulfate. Pellet was sonicated in 10 mM Tris HCl buffer, pH 8.0, containing 5 mM MgCl2, in order to collect the intracellular proteins. A modification of the western blotting assay was used to detect bacterial proteins able to bind to milk components. SSP and IP extracts were resolved on 8% SDS-PAGE and transferred to a nitrocellulose membrane (hybond C, Amershan Biosciences, USA). The membrane was incubated with milk proteins (either sIgA or Lf) during 4 h at 8°C, followed by incubation with either anti-SC or anti-Lf diluted to 1:2,000; for 4 h at 8°C. 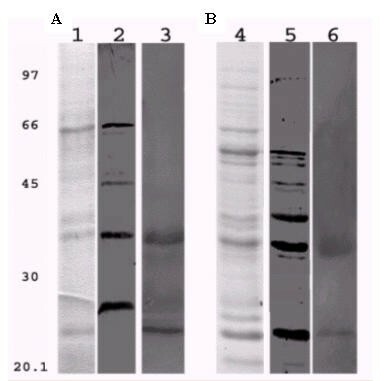 The membrane was incubated with secondary antibodies (Sigma, USA) and the reaction was detected using ECL detection system (Amershan Pharmacia Biosciences, UK). The statistical analyses performed included Student-t test. SPSS software (version 10.0) as used to determine significant results. We acknowledge the manuscript revision and the technical support of Marlene Teixeira De Souza, Kalinka de Melo Carrijo and Cynthia Maria Kyaw and thank P.J. Sansonetti for providing S. flexneri BS 176 strain. EMW carried out all assays, RLL providing human milk samples, LGG conceived of the study, and participated in its design and coordination. All authors read and approved the final manuscript.